Quantum Mechanics for Chemists is designed to provide chemistry undergraduates with a basic understanding of the principles of quantum mechanics. The text assumes some knowledge of chemical bonding and a familiarity with the qualitative aspects of molecular orbitals in molecules such as butadine and benzene. Thus it is intended to follow a basic course in organic and/or inorganic chemistry. The approach is rather different from that adopted in most books on quantum chemistry in that the Schrodinger wave equation is introduced at a fairly late stage, after students have become familiar with the application of de Broglie-type wavefunctions to free particles and particles in a box. Likewise, the Hamiltonian operator and the concept of eigenfunctions and eigenvalues are not introduced until the last two chapters of the book, where approximate solutions to the wave equation for many-electron atoms and molecules are discussed. In this way, students receive a gradual introduction to the basic concepts of quantum mechanics. 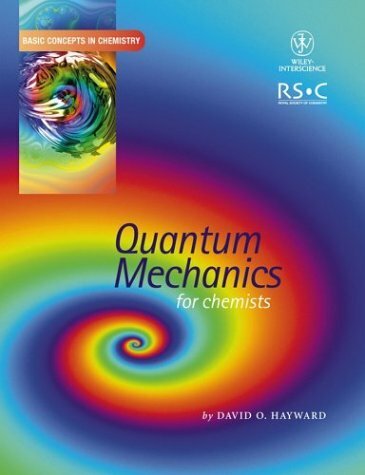 Providing chemistry undergraduates with a basic understanding of the principles of quantum mechanics, this book is ideal to follow a basic course in organic and/or inorganic chemistry. Some knowledge of chemical bonding and a familiarity with the qualitative aspects of molecular orbitals in molecules is assumed. The book takes a unique approach, introducing the Schrodinger wave equation, the Hamiltonian operator and the concept of eigenfunctions and eigenvalues at a later stage. This gives students a gradual introduction to the basic concepts of quantum mechanics. David O. Hayward is Professor in the Imperial College of Science, Technology and Medicine, University of London.